PRN is a raw print file created as the result of "printing to file". In other words, instead of printing a document directly to a printer, it is printed to a printer file (PRN file) which can later be sent to a printer. This is particularly useful when working on a computer that is not connected to a printer, as then a document may be changed into a PRN file, copied on another computer, and then printed from there. A PRN file is created by choosing “Print to File” in the Print ‘dialog box’. This new .prn file contains the exact same text and content as the original document as well as instructions for the printer such as number of pages to be printed, the margins to be set, the spacing to be used and so on. The file may be opened in a text editor such as Word Pad, but along with the text, a lot of printer codes will also be seen. These codes are the instructions for the printer. An important thing here is that these codes are only for whichever printer was selected in the printer dialog box when the file was created. Hence, the printer selected while creating the file and the printer to be used to print the file should be exactly the same. Besides the two printers being the same, in order for the file to be printed, the printer to be used in printing should be set as the default printer. If it is not, then it should be set so through the Control Panel. Another precondition is that the printer should be connected to a physical port and not via USB. To print a PRN file in Windows, use the Command Line interface: Start menu->Run->"cmd". In Mac OS X, PRN files are printed by dragging the file to the desktop printer icon. PRN files are supported by many programs. 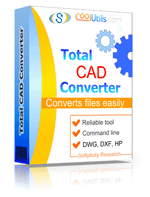 To easily convert PRN files to DXF, WMF, PDF, JPEG, TIFF, or PNG try Total CAD Converter.